TEAC 'mini Aurb' iPod dock has built-in DAB/FM radio | What Hi-Fi? TEAC's Aurb iPod dock has shrunk, this being a more compact version of the original SR-100 model. 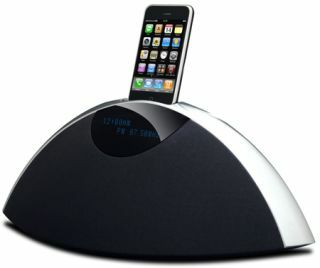 It has a similar curved design, and is equipped with a DAB/FM radio as well as iPod dock. Measuring just 40 x 21.5 x 16cm (WxHxD), it delivers 2 x 15W of power through its stereo speakers, can play MP3 files via its USB connection and comes with a remote control as standard. Bass is enhanced by TEAC's proprietary MAXX Audio DSP technology. Users can select playlists, artists and albums using the remote, and there's a composite video output on the back for hooking up to your TV. External analogue devices such as an MP3 or CD player can be connected via the stereo RCA sockets. The TEAC SR-80iDAB is available now for £150 in black/silver, grey/silver and red/silver finishes.